Blood is a scarce and costly resource. Transfusion is often required after major trauma but blood may not be readily available, and concerns remain over the potential adverse consequences of allogeneic blood transfusion. Intraoperative blood salvage (IBS) is used extensively after blunt abdominal trauma, but when blood is contaminated by enteric contents its use has been considered contraindicated. This was a randomised, controlled trial conducted with Ethical Review Board approval in an inner city trauma unit. Patients with penetrating torso injury requiring a laparotomy and who had exhibited hypotension either pre-hospital or on arrival and in whom there was considered to be significant blood loss were randomly assigned to 2 groups. The control group was given allogeneic blood transfusion at the discretion of the attending medical staff. The cell save (CS) group underwent IBS with transfusion of both allogeneic and autologous blood. All patients received prophylactic antibiotics. The primary outcome was exposure to allogeneic blood up to the first 24 hours postinjury. Twenty-three patients were entered into the control group and 21 into the CS group. The groups were equivalent in demographic details, injury patterns and injury severity. The mean volume of salvaged blood re-infused in the CS group was 1,493 ml (range 0–2,690 ml). The mean number of units of allogeneic blood transfused in the first 24 hours in the control group was 11.17 compared to 6.47 in the CS group (P = 0.008). Enteric injury had been sustained in 17/23 (75%) of the control group and 18/21 (85%) of the CS group (P = NS). Survival in the control group was 8/23 (35%) compared to 7/21 (33.3%) in the CS arm (P = NS). Patients with documented postoperative sepsis were significantly more likely to die compared to those without sepsis (P = 0.04); however, those patients in the CS arm were no more likely to develop sepsis compared to those who received allogeneic blood alone. 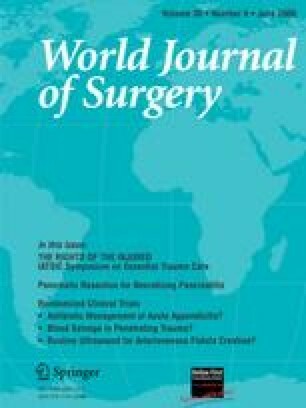 In this randomised, controlled trial for patients with penetrating abdominal injuries, IBS led to a significant reduction in allogeneic blood usage with no discernable effect on rates of postoperative infection or mortality.